Sally taught her classes thoroughly and well and she was always very popular with the children. Her love of chocolate raised much amusement among her colleagues and she often stock-piled tasty items in her desk drawer – secret, or so she thought, waiting for wolfing at a later date. Many years ago, when we were housed in the old Junior School (where the swimming pool now is) Terry Glenville (ex-colleague, swimming champion and wit) guided a remote-controlled car along the corridor and into Sally’s room, carrying its precious gift of one Thornton’s Viennese Truffle, especially for her. Sally was – and still is – much loved in the Junior School Staff Room. Always beautifully attired with nails immaculate and hair just so. By all accounts, she is thoroughly enjoying her retirement (shopping, golf, a pup to train...) and can’t recommend it highly enough. Only the other day, she called in to see us all, bearing a large and delicious carrot cake. 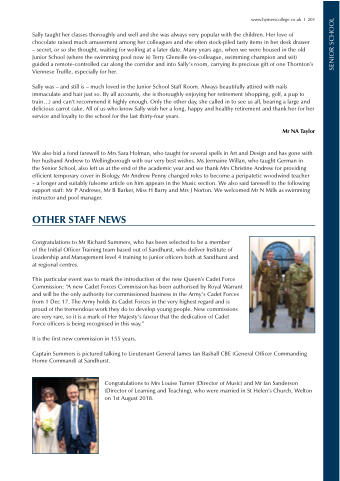 All of us who know Sally wish her a long, happy and healthy retirement and thank her for her service and loyalty to the school for the last thirty-four years. the Senior School, also left us at the end of the academic year and we thank Mrs Christine Andrew for providing efficient temporary cover in Biology. Mr Andrew Penny changed roles to become a peripatetic woodwind teacher – a longer and suitably fulsome article on him appears in the Music section. We also said farewell to the following support staff: Mr P Andrews, Mr B Barker, Miss H Barry and Mrs J Norton. We welcomed Mr N Mills as swimming instructor and pool manager. of the Initial Officer Training team based out of Sandhurst, who deliver Institute of Leadership and Management level 4 training to junior officers both at Sandhurst and at regional centres. It is the first new commission in 155 years. Captain Summers is pictured talking to Lieutenant General James Ian Bashall CBE (General Officer Commanding Home Command) at Sandhurst. Congratulations to Mrs Louise Turner (Director of Music) and Mr Ian Sanderson (Director of Learning and Teaching), who were married in St Helen’s Church, Welton on 1st August 2018.